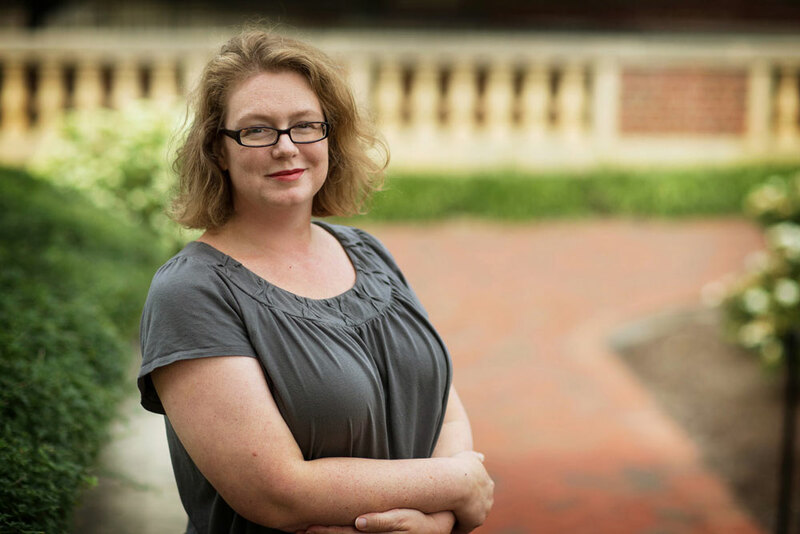 Through her research and innovations dating to the dawn of the digital age, Bethany Nowviskie, the director of digital research & scholarship at the UVA library, where she also directs the Scholars’ Lab, has been a pioneer in humanizing the computer revolution. Named one of “Ten Tech Innovators” for 2013 by the Chronicle of Higher Education, Nowviskie recently discussed digital storytelling and what the online age has meant for the humanities. 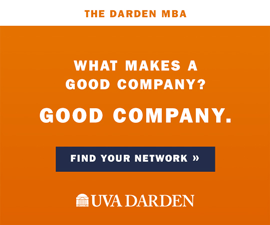 UVA Magazine: You describe your scholarly interests as lying “in the intersection of algorithmic or procedural method and traditional humanities interpretation.” How would you put that in laypersons’ terms? Nowviskie: This is just a highfalutin way of saying the kind of scholarship I’m interested in blends two approaches that many people falsely assume are in opposition. On the one hand, there’s the interpretive humanities—in which we appreciate and absorb and explain to ourselves the emotional, personal and aesthetic dimensions of things like art, literature and historical lived experience. And on the other, there’s computation and procedural method. The one seems ineffable and the other is the absolute definition of “pinned-down.” But these come together in the digital humanities. Can you walk us through the process, very generally, of how you tell stories digitally? When people come to the Scholars’ Lab, the first thing we do is listen—just teasing out all the possible stories that might be embedded in the data the scholar has amassed. Then it’s a question of helping you match the technology to the particular story you want to tell. Sometimes that means using an off-the-shelf tool (we tend to favor open source, non-commercial, scholar-driven, when possible), and sometimes it means adapting one or building something new. Scholars’ Lab staff spends time teaching people how to use the tool, exploring where the particular needs of your story might suggest an adaptation of its basic functions, and consulting and assisting with the overall design of the project. The most recent innovation in the Scholars’ Lab is Neatline. Can you tell us about that? Neatline, the most recent Scholars' Lab innovation, allows scholars, students and curators to tell stories through a variety of media, such as interactive maps. 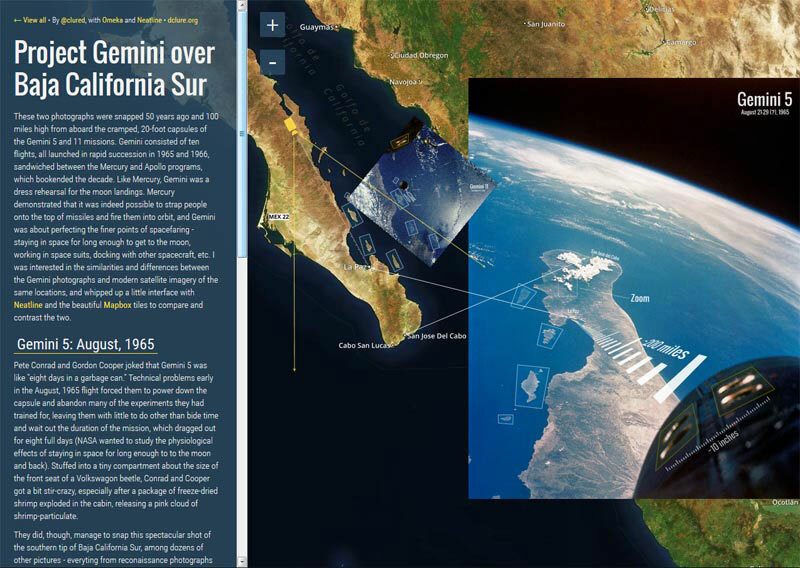 Click to check out the "Project Gemini over Baja California Sur" story. We built Neatline because we are a digital humanities center embedded in the heart of a major research library, with splendid holdings of manuscripts and rare books. 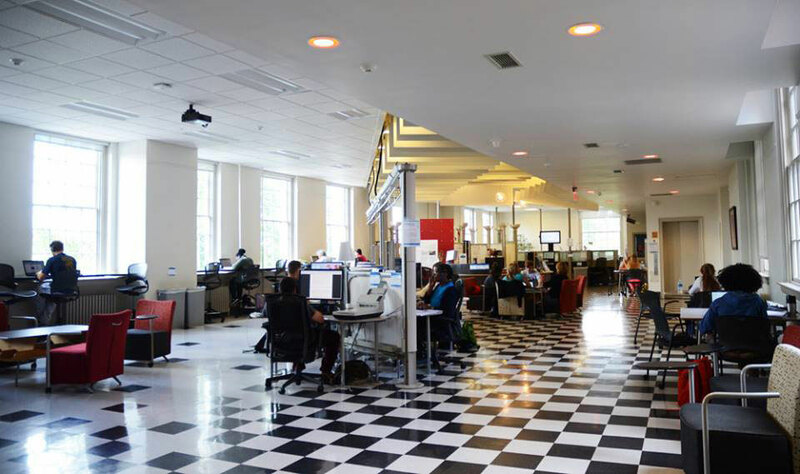 We wanted to make that essential connection between digital humanities and the archival collections it can illuminate more rich and meaningful, not just for us at UVA, but for digital humanities scholars and librarians everywhere. Online platforms are particularly well-suited for visualization – and the kinds of stories humanities scholars want to tell generally unfold in space and time — so we added the ability to link maps and timelines to digitized humanities collections. We also built in the capacity for the tool to support multiple—even conflicting or contested—stories told on top of the same archival collection. This means that different scholars or students can make their own arguments using the same set of materials, or a single scholar can try out multiple, differing interpretations or theses. That’s the way humanities interpretation works, after all. No matter the format, storytelling is storytelling. What are some of the commonalities between print era and digital era in regards to storytelling? Compelling use of language and design, sense of a story arc and either resolution for the reader or some clarity about the questions that have been left unanswered, the promotion of an emotional connection with the people and places described—all the things that make you say “storytelling is storytelling” are the commonalities. The chief differences are the ability to include multimedia, interactive and nonlinear elements as part of the tale. Have you been surprised by unexpected things that have come up as you forged ahead as one of the leading lights of digital humanities? One of the most gratifying and interesting things has been to observe the ever-increasing connection between our physical and digital worlds. As somebody trained in bibliography and book history (the most physical side of English) and in archaeology, where almost all humanities evidence is embodied evidence, I’ve always seen the digital and the physical as closely interconnected. But for a long time there was a “cyberspace” stereotype about my field—that digital humanities happened in a completely artificial, online world, divorced from real bodies and lived experience. That argument’s just not possible anymore. The ubiquity of mobile, wearable, and embedded devices, mass digitization of the print record, the study of the history of science and technology, the advent of 3D printing, the rise of augmented reality and social media—all of these things demonstrate how the physical and digital have always interpenetrated each other and are now even more obviously part of a cycle or continuum.